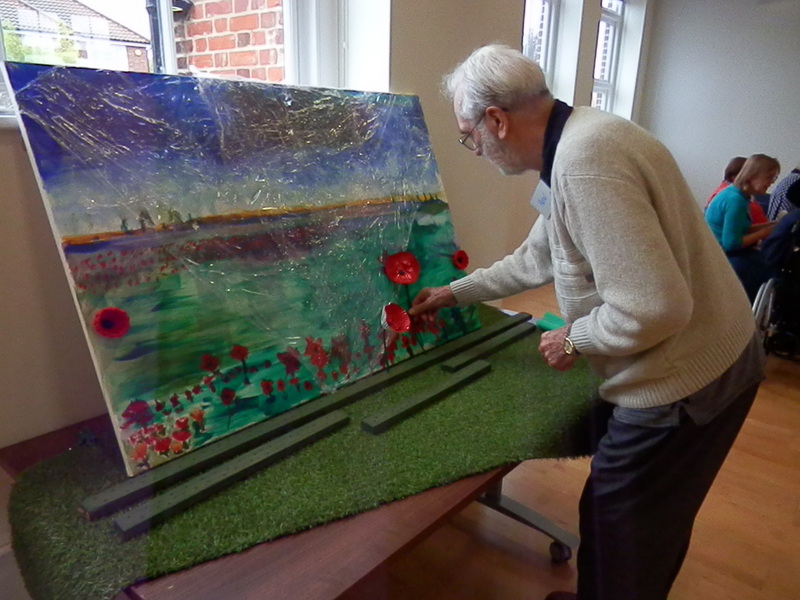 A few weeks ago we were asked if we had time to meet some special visitors from Great Yarmouth at the Millennium Library in Norwich as they had some poppies to pass on for our poppy project. 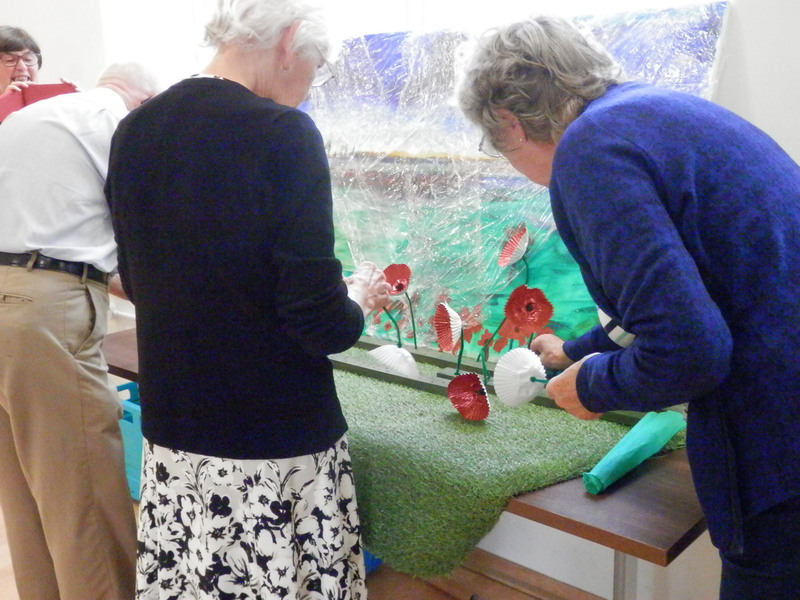 When the group arrived we found it was more than a ‘few’ poppies as in fact the Age Connected ‘knit and knatter’ group at the ACORN Centre in Yarmouth handed over a staggering 1011 poppies! 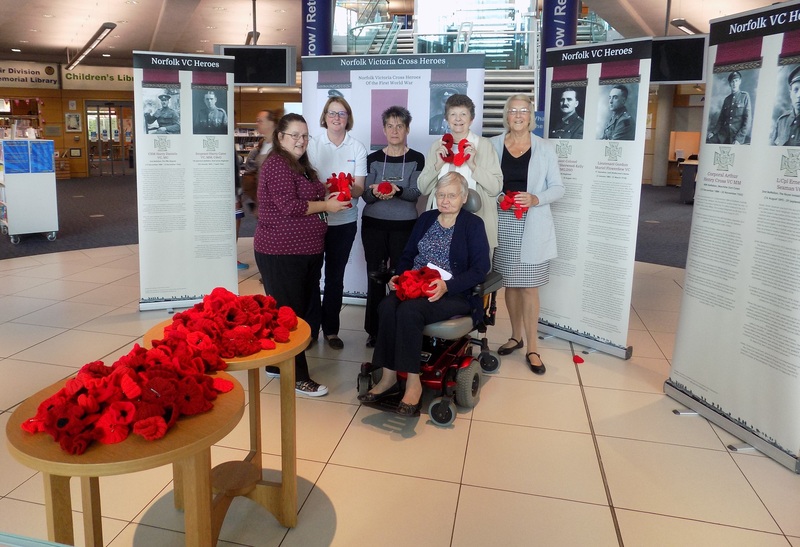 Margaret Rice and some of her fellow knitters came to the city to hand the sackful of poppies over in person and in particular pointed out the 3 very special ones which Margaret knitted with glitter in memory of her three uncles Arthur Williams Goldstink, Charles Samuel Goldstink and Herbert James Goldstink who died during this time. What made this day more special was that Margaret has not been in the city for almost 40 years! (L-R) Sarah Salmon, Norfolk Libraries; Sarah Lee, Age Connected; knitters Sue Gibbs, Janet Laxon, Rita Evans and in front is Margaret Rice. Jackie Tierney from the ACORN centre told us how knitting is a great way to bring people together and that the group always has a knitting project of some sort going on. 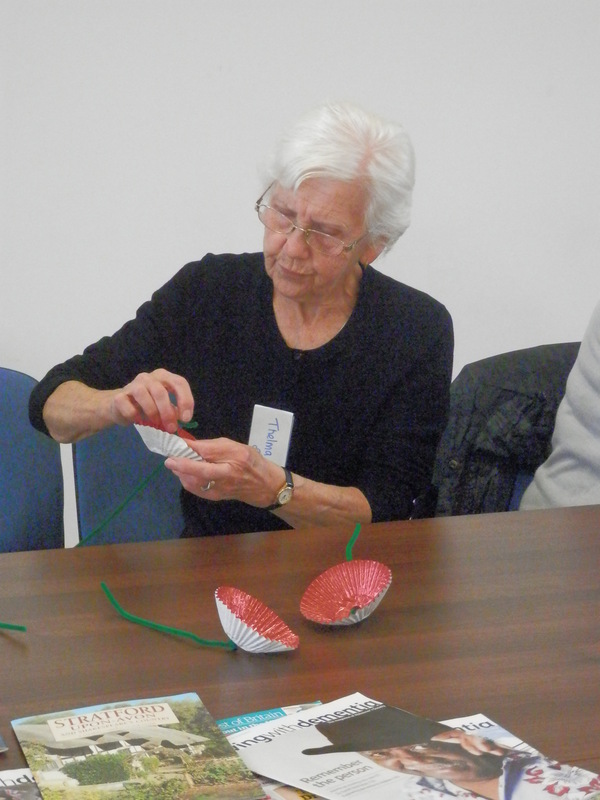 The knitters are now busy knitting smoothie hats to support AGE UK’s big knit,and their target this year is just over 6000 which in light of their wonderful poppies I think they will reach! 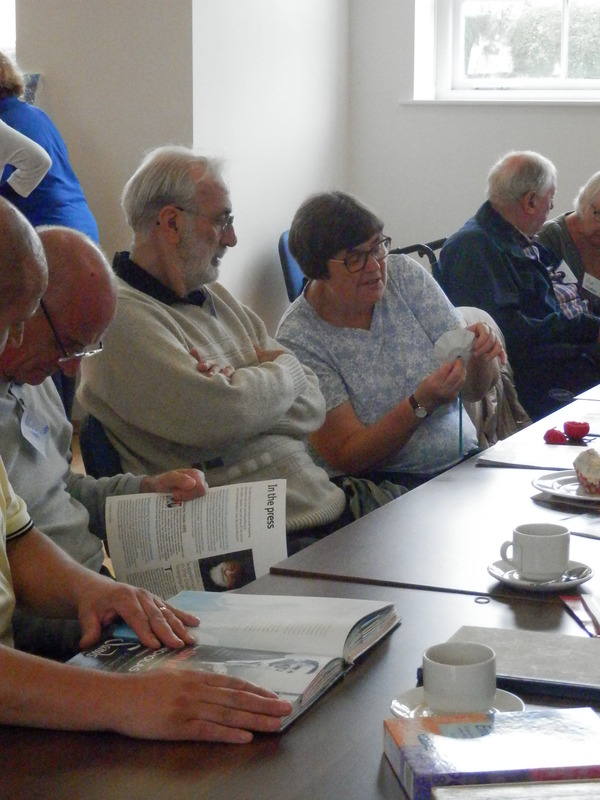 To keep the knitters going they are always looking for donations of wool so if any one can help or would like to join the group the ACORN Centre is open Monday to Friday – so why not pop in for a cuppa and see what they are up too. Stanley Sadler was born in Ridlington on the 19th February 1898, the fourth son of Robert and Rebecca Sadler’s ten children. Stanley enlisted in the Royal Navy on the 26th October 1916, for the ‘hostilities’, as his card records. He gave his place of birth as North Walsham (which is about 5 miles from Ridlington), and his occupation as blacksmith. From the 26th October 1916 to the 30th March 1917 he was a Stoker (2nd class) and based at Pembroke II, a shore establishment at Sheerness. 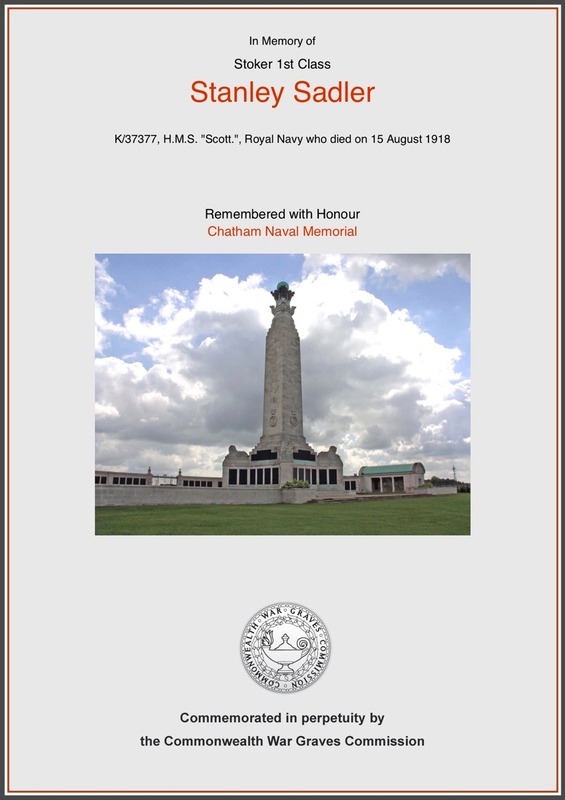 On the 31st March 1917 he moved to HMS Hibernia (based at Sheerness) and remained there until the 15th October 1917, when Hibernia was moved to Chatham Dockyard as an overflow accommodation ship. 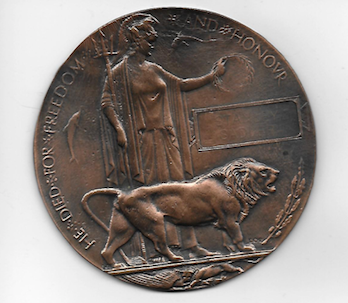 Stanley had been promoted to Stoker 1st class on the 19th July 1917. He returned to Pembroke II until the 27th December 1917, when he was moved to HMS Dido (a depot ship), from where he joined HMS Scott (see Figure 1). HMS Scott was the first of a new destroyer class built to be flotilla leaders for the V- and W- class destroyers. She was launched on the 18th October 1917, but less than a year after entering service she was sunk off the Dutch coast on the 15th August 1918. 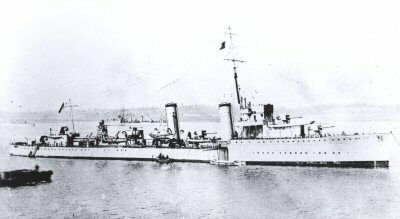 It is assumed that a German U-boat torpedoed her, but it is also possible that she hit a mine (the R-class destroyer HMS Ulleswater sank in the same incident). The German submarine U-71 which had been patrolling and mining the area is usually credited with Scott’s sinking. The wreck of HMS Scott lies approximately 20 nautical miles (23 miles) off the Dutch coast, lying upright with the stern in 35 metres (115 ft) of water, and the bow in 28 metres (92 ft). 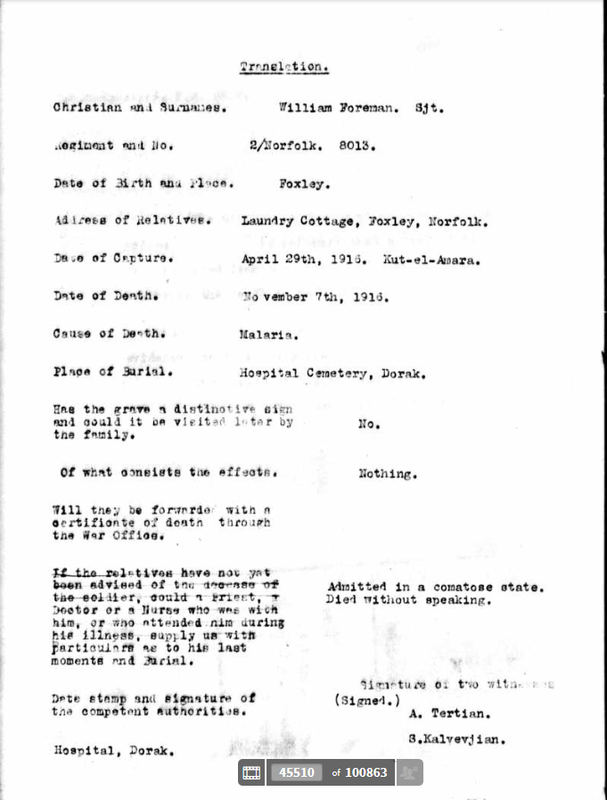 The Naval records for Stanley record that his widow, Agnes, was informed of his death on the 16th August 1918, and the address on the record is given as 8 Langthorne Street, Stratford (East London). 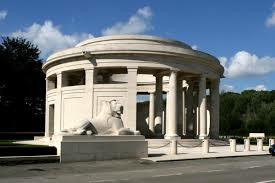 Stanley is commemorated on the Chatham Naval Memorial, which records those members of the Royal Navy who died in WW1 (and WW2) and have no known grave, the majority of deaths having occurred at sea where no permanent memorial could be provided; 8,517 sailors of the First World War are commemorated on the memorial. 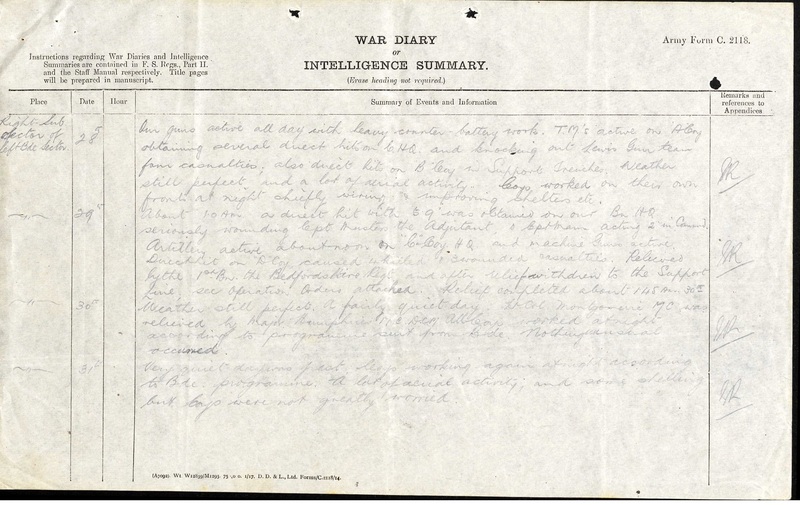 Further research in Stanley’s family reveals that his father, Robert Sadler, was born on the 8th August 1865 in Honing, the son of James and Hannah Sadler, and baptised on the 22nd August 1869, in Honing parish church. Robert married Rebecca Bacon in 1893. She was born in Honing in 1872, the daughter of Charles and Mary Bacon. In 1901, Charles and Mary Bacon were living at Raw Hall, Wood Norton; Charles was a farmer. He died in 1901, aged 70, and is buried in Wood Norton. Mary Bacon continued to live at Raw Hall with her son Robert John Bacon and his family. Robert Sadler died in 1922, aged 56, and is buried in Wood Norton. Rebecca Sadler died in 1955, aged 82, in Hoxne, Suffolk, but is buried in Wood Norton. 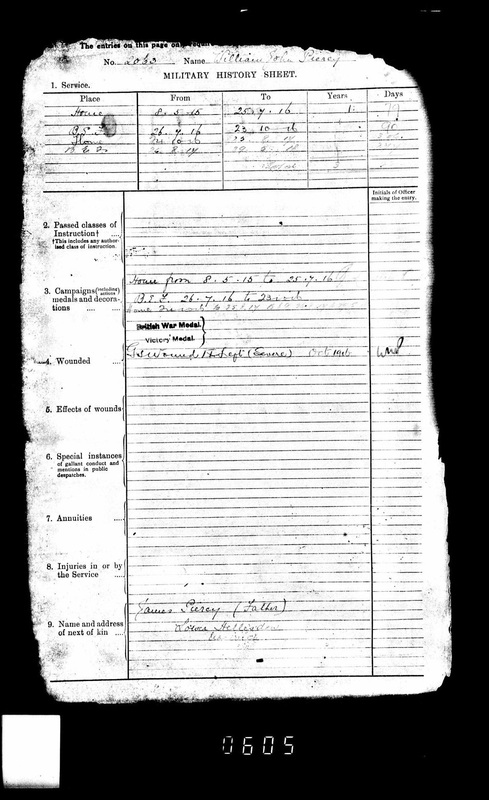 In the 1911 census, George is aged 16, and a farm labourer. 19th February 1916, aged 20, Carlton, New York, USA. Fred 14th October 1895, Ridlington. 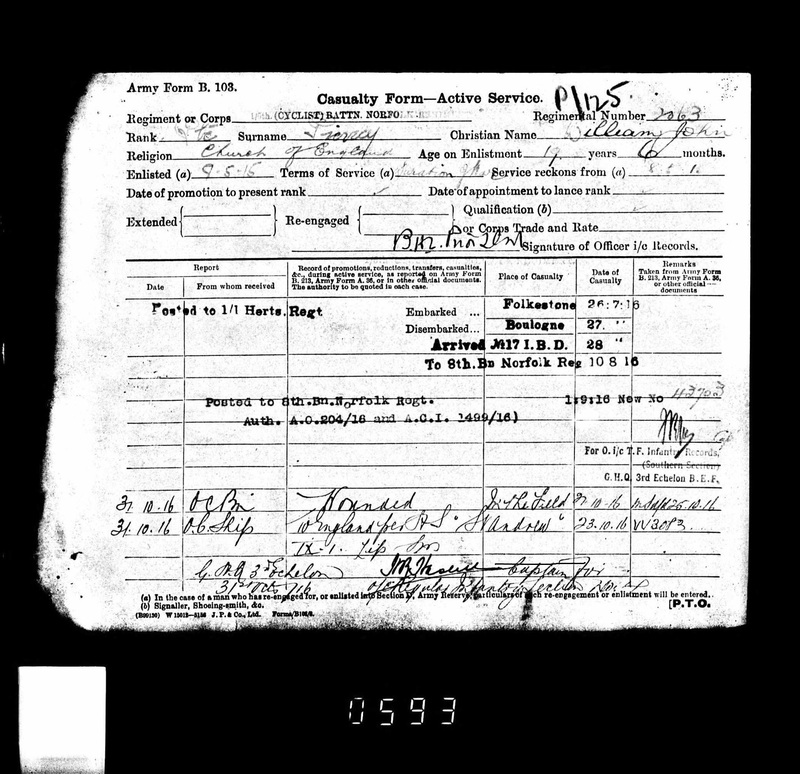 In the 1911 census, Fred is aged 15, and a farm labourer. Fred married Anna Tebble in July 1916 in Wood Norton (Stanley Sadler was a witness), and he served in WW1. 1974, aged 79, Essex. In the 1911 census, Robert is aged 14, and a farm labourer. 1912, aged 16. Stanley 19th February 1898, Ridlington. In the 1911 census, Stanley is aged 13, and a farm labourer. 15th August 1918, the Dutch coast. Arthur 4th June 1899, Ridlington. 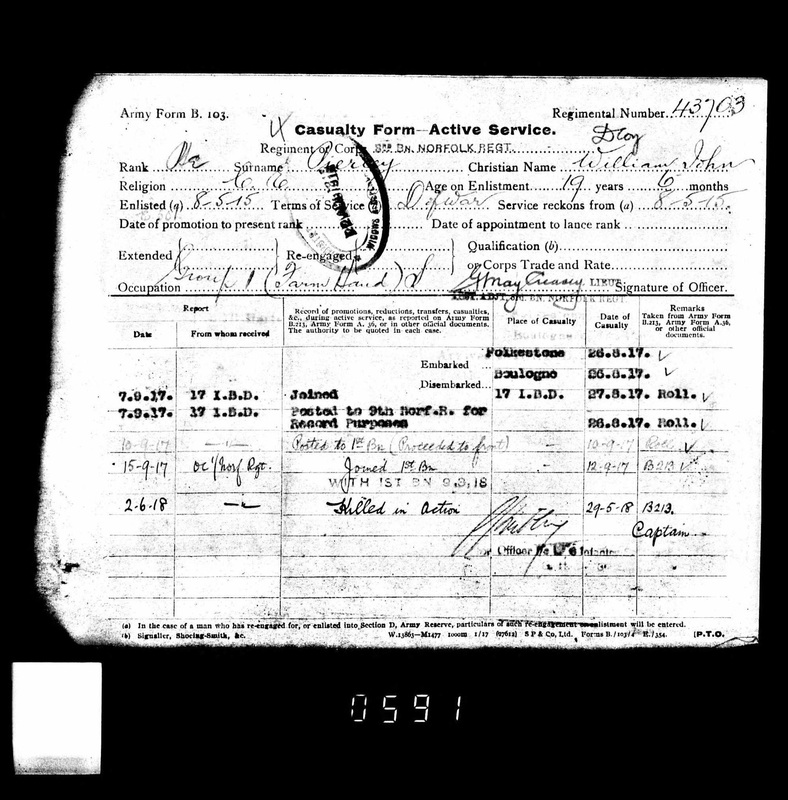 In the 1911 census, Arthur is aged 11, and at school. 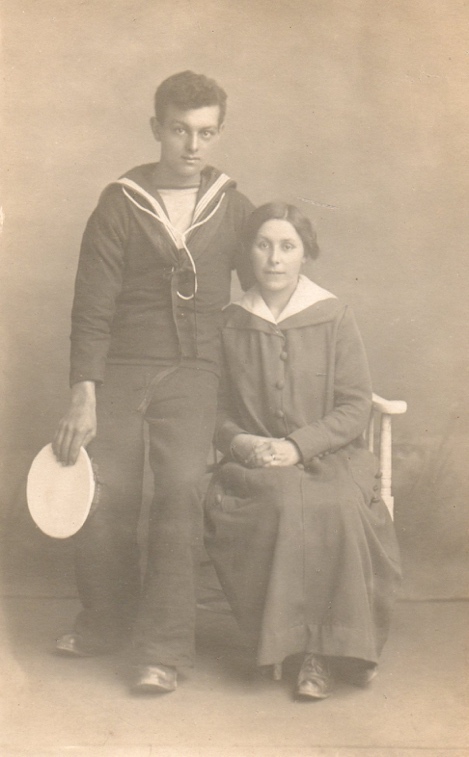 He served with the Royal Navy in WW1, and married Ivy Alice Pointen in October 1929 in Wood Norton. 1985, aged 85, Norwich. In the 1911 census, Edward is aged 9, and at school. 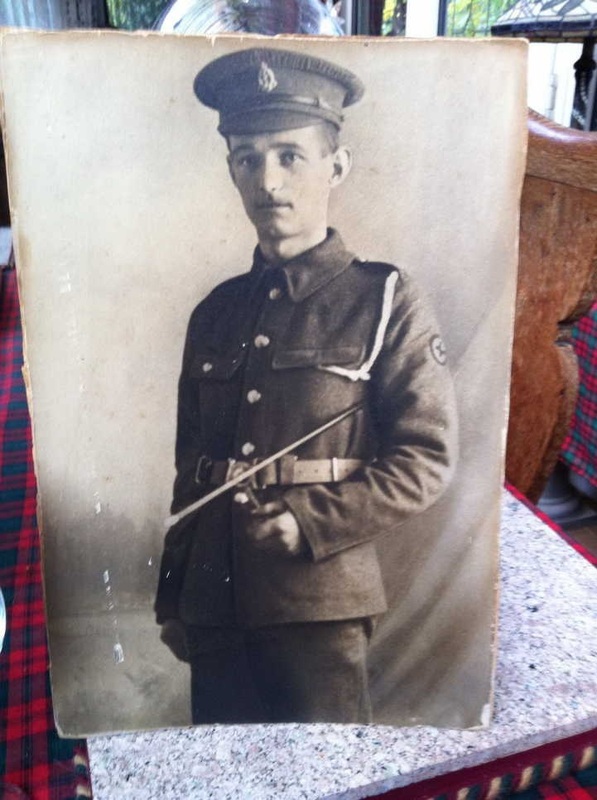 Edward served with the Royal Marine Light Infantry Division in WW1, and emigrated to Australia in 1922. 1976, aged 75, Australia. In the 1911 census, Elsie is aged 7, and at school. She married George Bacon in 1924. 1982, aged 79, Suffolk. In the 1911 census, Sidney is aged 5. He spent time working in Canada in the 1920s and 1930s. In the 1911 census, Charles is aged 3. 1993, aged 85. Their last child, Herbert William Sadler, was born on the 30th August 1912. He married Gladys M. Warnes in 1937. Herbert died in 2011, in Fakenham, aged 99. 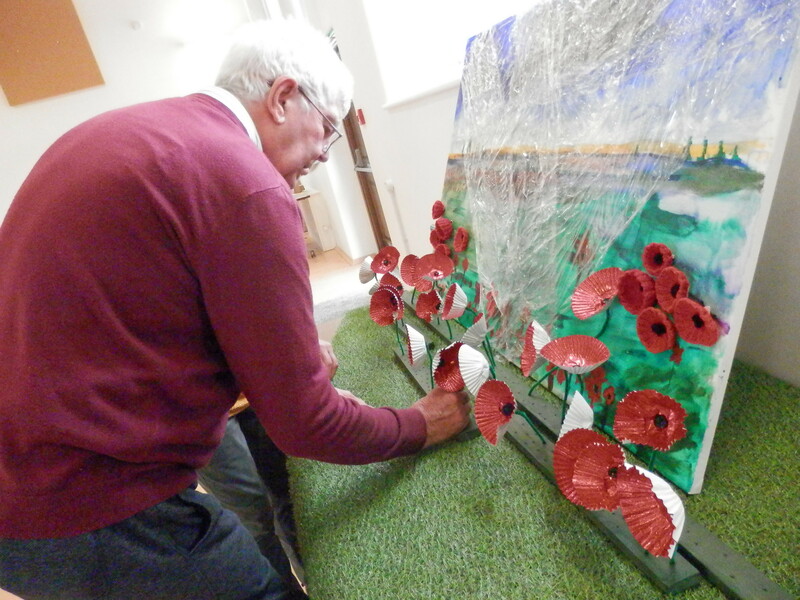 Fred, Arthur and Edward Sadler are all commemorated on the war memorial in All Saints, Wood Norton, which records the servicemen who served and died, as well as those who survived, the WW1 conflict. Stanley Sadler’s name also appears on the war memorial at Bawdeswell, church (approximately 6 miles from Wood Norton), but the link with Bawdeswell is not yet known. 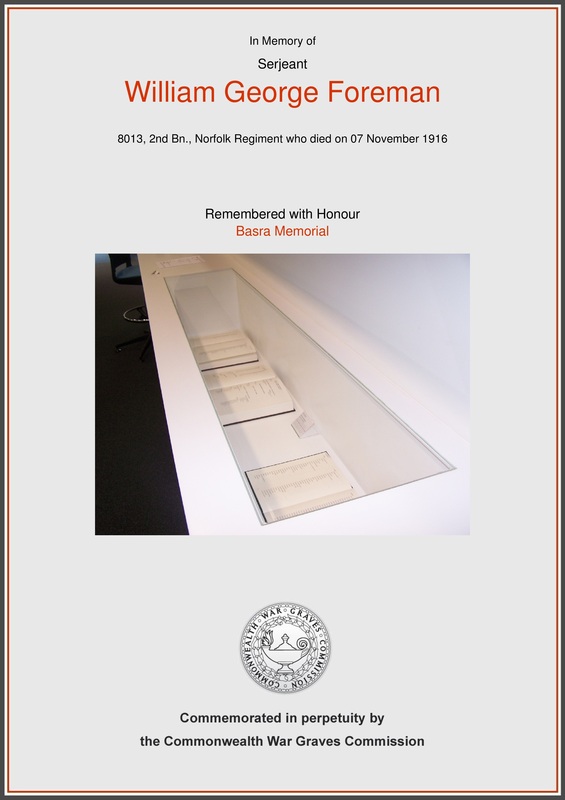 We have been fortunate to be able to contact Stanley Sadler’s relatives, who have provided us with information on the Sadler family, including photographs of Stanley and his wife (see Figure 2), and his Memorial Plaque (see Figure 3). Figure 2 : Stanley Sadler and his wife, Agnes. The hat band bears the name HMS Scott. A 1914 cartoon from a Casseretto/Winter family notebook (family members worked in local weaving and brush-making industries during the 19th century). This is just one of several hundred newly digitised original photographs, posters and notices connected with the First World War in Norfolk. 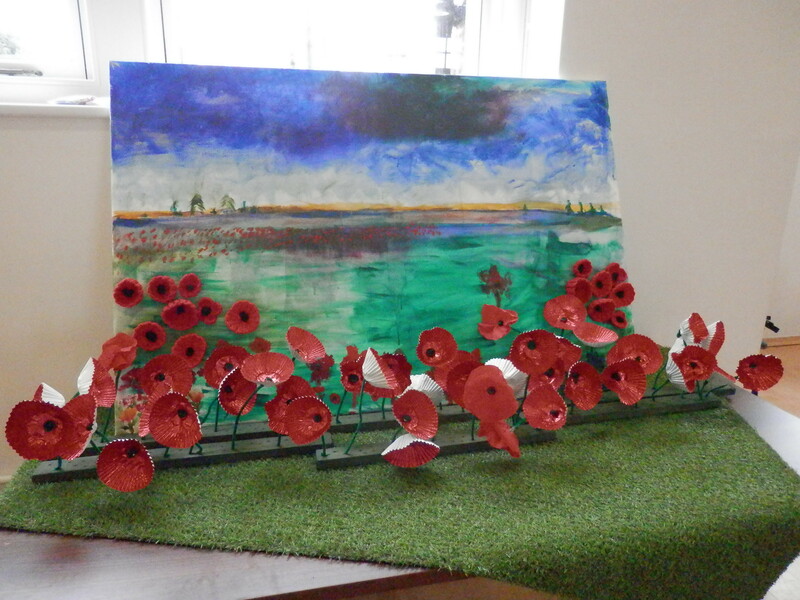 The material is held in the collections of the Norfolk Heritage Centre, Norfolk Record Office and Norfolk Museums Service. Over the course of the next few years the images will be posted on http://www.picture.norfolk.gov.uk/ (the picture archive run by Norfolk County Council Library and Information Service).